Welcome the chilly season in style with this Winter Mix assorted mini Colorful Cutouts. The 38 cutouts in a variety of cool designs ensure that your classroom stays styled for the season. They range in size from 3"" x 3"" to 2-1/2"" x 3"". 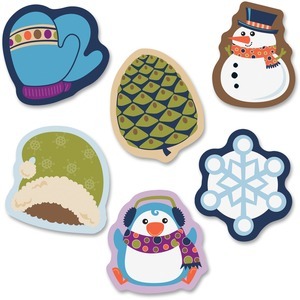 The set also includes six snowflakes, four mittens, four pinecones and eight each of hats, penguins and snowmen. This time-saving solution adds fun and function to your learning environment. The mini colorful cutouts can be used for accenting bulletin boards, message displays and more. Designed to be versatile, these cutouts can also serve as classroom labels, game pieces, name tags, cubby tags, door decorations and reward cards. Be sure to add the coordinating products and decor to create a stylish classroom theme.